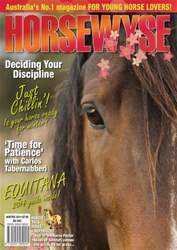 In our wonderful Winter 14 issue of HorseWyse, HW's favourite trainer Carlos Tabernaberri teaches us the importance of patience in horse training. We'll also discover the magestic beauty of the Fell pony and meet the colourful Calico brumbies of Arizona! We'll also take a closer look at the different equine disciplines best suited for you and your horse...plus we reveal Australia's horsiest bedrooms EVER! Along with heaps of horse training advice, reader stories, fun activities and FAB winter comps, make sure you grab our FREE HW Year of the Horse Peta Taylor collector's poster inside this issue!